A dragon who spent much of his life transformed into a teapot and a sad, solitary girl become friends and take on the task of finding the missing dragons of Vienna. Though born in 1803, the dragon Grisha spent most of his life frozen into a teapot by an evil sorcerer, able to hear and see, but unable to move or speak. Released from the spell after what Grisha has only heard called the great war, he flies to Vienna to join the other dragons of Europe. Forty years later, Maggie who lives with her poet father in a Viennese hotel, becomes friends with Grisha and the two together work through Grisha’s clouded memories and the menace of the Department of Extinct Exotics to find the missing dragons and face the menace of the sorcerer who captured Grisha. Verdict: I cannot recommend this title too much. 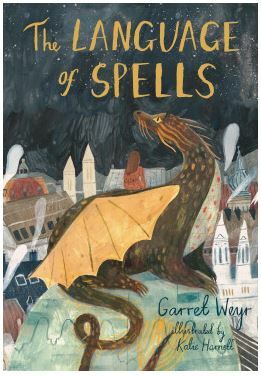 Garret Weyr’s gorgeous flowing language carries this fantasy with its twinned themes–that magic carries a heavy price and that humans become incapable of seeing that which they do not believe—to a satisfying ending. Weyr excels in weaving emotions into the fabric of the story and Maggie’s conflict about her mother’s death is an important thread. Though Grisha’s life encompasses the tumultuous 19th and 20th centuries of European history, his teapot imprisonment prevents him knowing more than hints of the horrors of the Holocaust, though careful readers will catch the references in Yakov’s letters to his family and in the evacuation of family and children to the English countryside. Likewise, the menace of the Department of Extinct Exotics and the sorcerer echo the threats of the Cold War and totalitarian governments of post-war Europe. I did not find that Katie Harnett’s illustrations added to my enjoyment of the story. Her style of illustration, while pleasant, did not match the elegance of Weyr’s prose. Other books by the author (published under the name Garret Freymann-Weyr) include My Heartbeat (a 2003 Printz honor book), Stay with Me, After the Moment, When I Was Older, and French Ducks in Venice. I find this one of the best books I’ve read recently. I recommend it for all middle grade, high school, and public, libraries. I can only hope that it becomes available as an audiobook. 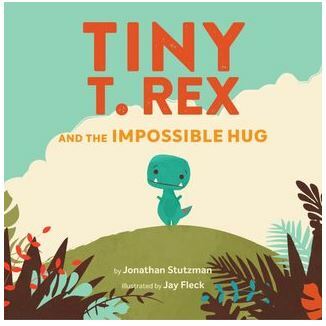 Tiny the Tyrannosaurus Rex is anything but intimidating in this story. All he wants to do is learn how to give a hug, but he finds his arms are too small to go around anyone to hug them. Lots of friends want to help, and they recommend practice, getting strong, and planning a strategy. He works hard, makes some mistakes, but in the end Tiny finds that he can give big hugs even if his arms don’t do the whole job. Cute illustrations, including the end papers. Nice story (though not compelling enough for a toddler to demand repeats), teaching a lesson in getting beyond physical limitations. March 2019 review by Ann Goddard. In the third book about friends Lupe, Elirio, and Flapjack with gato, Genie, stories fill in the missing pieces of their first meetings. 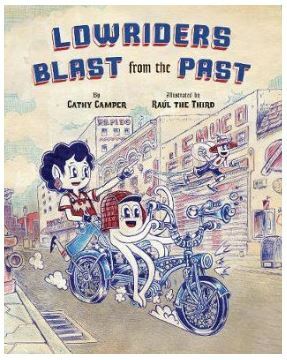 Plots in this graphic novel include how two bullies try to keep Lupe’s two mothers from entering a car show and the friends help them get qualified. Verdict: Wordiness slows down this third book, but the art and use of indigenous words makes it valuable. January 2019 review by Nel Ward. 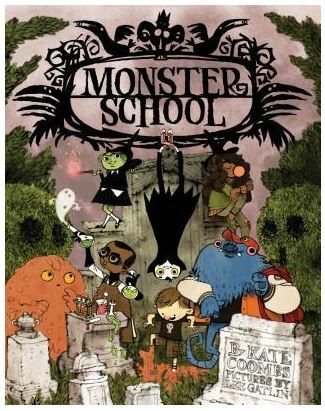 This is a book about Monster School. Children will see something of their own school experiences in this dark book- for example classmates with a variety of characteristics and personalities, odd teachers, horrible homework, and new kids. Each poem or piece is set against gloomy, detailed (digital?) artwork. VERDICT: Older kids will enjoy this book in the fall when they’re getting ready for Halloween. I found some spreads to be too crowded with text for young readers, but the humor will carry it for most. November 2018 review by Carol Schramm. Hilarious! 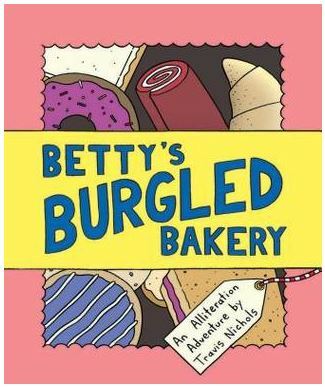 The bakery has been robbed of all its tasty treats, and the Gumshoe Zoo detectives are called in to solve the case. The story is told in a comic book style, and we follow the detectives through their investigation. The dialogue is full of great vocabulary and lots of alliteration, and various parts will twist your tongue if you read this out loud. For example- “gluttonous gobbler of gluten-y goods.” The mystery is solved- it’s a case of sleep eating! 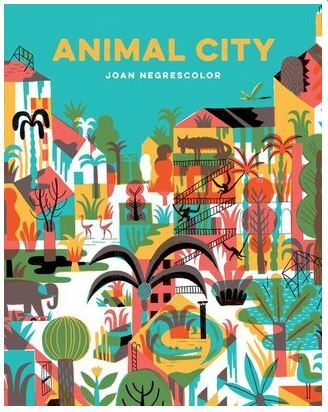 The illustrations are blocky, colorful and fun. Toward the end, we have a definition of alliteration, and a page that describes some hungry animals (this part didn’t quite seem necessary to me). VERDICT: This book will be very entertaining to kids who are learning to play with language. I think it might work well in writing classes with kids older than 8 as a fun prompt. October 2018 review by Carol Schramm. This creative story uses repeating phrases to convey conflict – Dun Dun Duh! and resolution – Ta-Da! Two children go back and forth changing the direction of the story; taking it from a crystal castle, to a pirate ship, to an island vacation… wherever their imaginations take them. Along the way they encounter dragons, pirates, and magicians. The vivid illustrations are bold and provide lots of interesting details. In the end, the little girl and little boy work to use their magical powers together to create the perfect story. Verdict: This is a great book for both school and home. 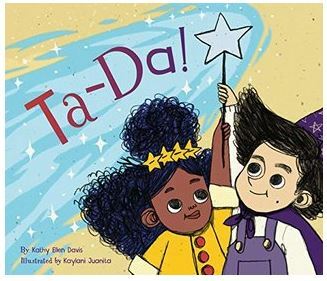 Children can see the power of using imagination come to life in this book. I also see this as a great book for young siblings dealing with conflict resolution.